Food aggression in dogs is a tough, but necessary, topic to address. If your dog is showing signs of aggression to people when eating or around food, it is really important to nip it in the bud. In fact, it’s a great idea to talk to a professional about stopping food aggression in dogs right away so that you can make sure it does not progress. Unfortunately, food aggression in dogs is very common. But if left unchecked, this type of aggression can grow into a serious problem. 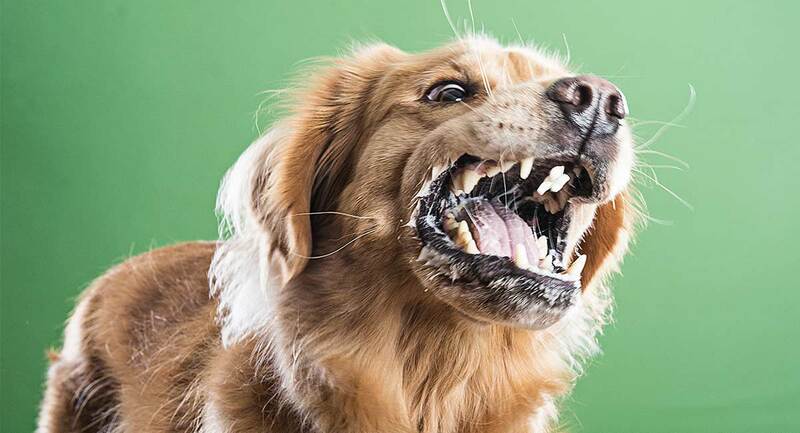 The most serious cases of food aggression can involve households with children or dogs with medical or other behavioral issues that cause the dog to bite and injure someone who interferes with his food. What Does Food Aggression Look Like? Unfortunately, there are so many reasons that could make a dog possessive of food. Researchers in canine evolution and behavior say that dogs are naturally hard-wired to be protective of every meal. 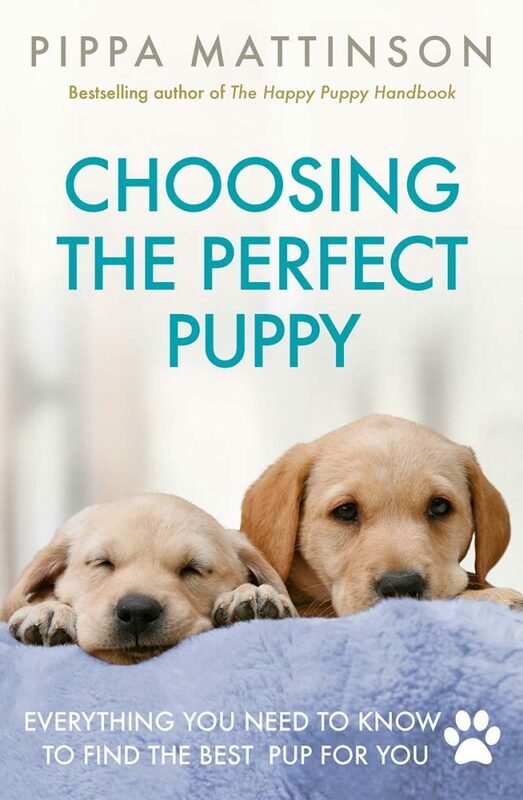 Dr. Sophia Yin is a veterinarian and dog behaviorist who has conducted extensive scientifically backed research into canine history, behavior and training techniques. What does the science say about food aggression in dogs? One study reported as high as 20 percent of dogs show traits of food aggression while in a shelter setting. Thirty percent of dogs adopted from a shelter were reported by owners to show characteristics of food guarding. So, we can say that food possessiveness is an innate trait in dogs, but it can also be learned from puppyhood from competition over limited access to resources. In some cases, trauma or a major event could make a dog protective of food. Post-traumatic stress disorder occurs in the world of canines too. Events that could cause emotional trauma in dogs include natural disasters, getting hit by a car, the loss of a caretaker, being in a combat zone, physical abuse by an owner or a fight with another dog. Any of these traumas could make a dog protective of food. There’s also a case to be made for dogs who aren’t raised in a shelter and who have access to all of the resources they need. Sometimes a perfectly healthy dog who has suffered no trauma can still end up with food aggression. For example, there are some purebred dogs that are genetically predisposed to aggressive tendencies. Some breeds were artificially selected over several generations for guarding instincts. Breeds like German shepherds, rottweilers, Dobermans, and chowchows were selected for guarding traits. Though typically their guarding is relegated to property or livestock, poor breeding or an unlucky combination of genetic traits can cause these guarding instincts to spread to other areas of their routine. When it comes to genetics and breeding, mother nature has a way of being uncontrollable. You may never know why your dog becomes food aggressive. If your dog growls when eating, it’s important to first rule out any medical problems that could cause anxiety or pain while your dog is eating. Take your dog to a vet. Tell the vet about the food aggression behavior. Let the doctor physically examine your dog for any medical conditions that might cause him to be anxious or in pain while he’s eating. Dogs that have an infected tooth or any dental issues could be in pain while they are eating. Hearing problems can also put dogs on the defensive when they are eating. If your dog has a thyroid imbalance, it could make him more aggressive than usual as well. Joint pain is another reason a dog might be more aggressive while he is eating. There are actually several medical reasons that could make a dog aggressive over food, so it’s important to start with ruling that out through a veterinarian before working on your training. There are several training techniques that can help stop food aggression. 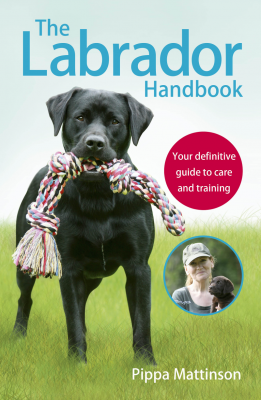 Determining which to use is typically the role a professional trainer or dog behaviorist. Depending on the severity and characteristics of your dog’s food guarding, it may be recommended to try one of the following strategies. Desensitize your dog to the presence of people and other dogs while he’s eating. Create a positive association between people and food. Desensitization can be done by remaining near your dog while he is eating. Depending on the severity, this might be anywhere from 3 yards away to 30 yards away. You may be able to stand, but you might find it easier for the dog to relax if you are seated either in a chair or on the floor. Watch your pup’s body language carefully. If his hackles raise, he starts growling, baring his teeth or freezes, then you are too close to his threshold of tolerance. After a week, you should be able to move closer to your pup while he’s eating. Try talking or humming in a low voice while somewhat ignoring him. Try going about your regular business, while moving closer and closer to him. For example, you could be preparing your own breakfast while moving around the kitchen and simply take a few steps toward your dog and back again. This way, you can gauge his tolerance of your proximity while he’s eating. If after two weeks of daily interaction this way with your dog while he’s eating, you are not able to approach within 3 yards of your dog without him tensing up or growling, you should call a professional. Positive association can be created by tossing treats steadily toward the dog while he is eating. It works best if the treats are tastier than your dog’s regular kibble meal. At every meal for a week, toss these tasty treats in your dog’s direction while he is eating. If he does not leave his bowl to explore the treats, he is over his threshold and feels like he must keep guarding his bowl. After a week, your dog should be relaxed enough in your presence to approach you for a tasty treat, even if his food bowl is full. You can switch from giving him extra treats to simply feeding him his daily meal by hand while his food bowl is empty. After a few more days, your dog should be comfortable eating meals from your hand. After a second week of this positive association, your dog should be eager to see you approach, even if he is eating from his regular food bowl. 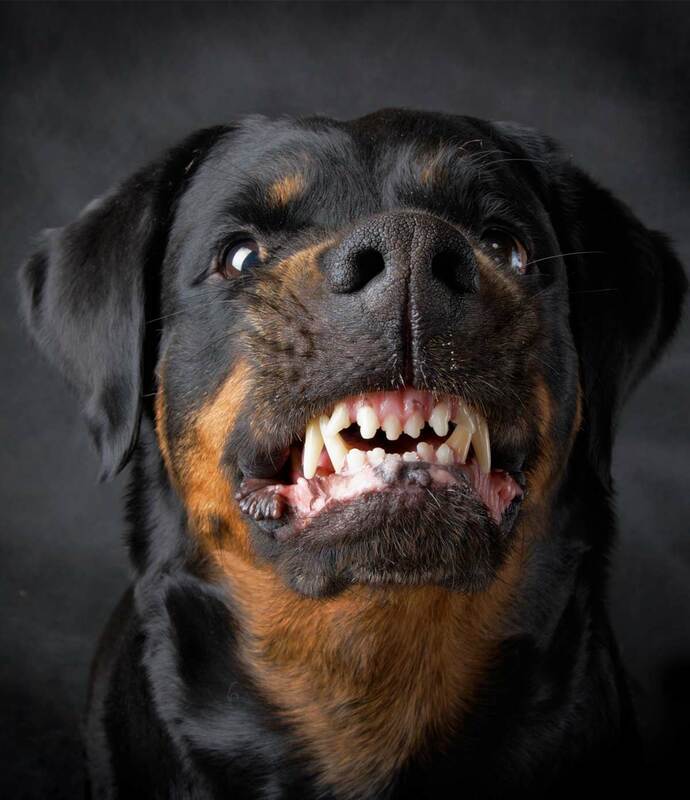 If after two weeks, your dog still tenses up or growls when you approach, you should call a professional. Training specific behaviors with food rewards can also help reduce food aggression. First, teach your dog to sit for a treat. Then, teach him that “sit means please”—you can learn how to do this with my in-depth guide here. Practice “sit means please” with all sorts of behaviors and rewards. For example, every time you go to the back door to let your dog out, wait until he sits. “Sit” means “please, can I go outside?” and the reward is opening the door and letting him go outside. Another example would be to take out your dog’s leash—usually a trigger for excitement to go on a walk. Wait for your dog to sit before clipping the leash on his collar. “Sit” means “Let’s go for a walk,” and the reward is putting the leash on and going for a walk. You can also have your dog on a leash, and toss a toy or a treat just out of his reach. Stand still while he struggles to reach the toy/treat. Ask him to sit. “Sit” means “Oh, I want that!” and his reward is being led over to reach the toy/treat. If you train your dog that “sit” will earn him all sorts of things he wants, he’ll learn to be less protective and greedy about things he wants, including his food bowl. Help, My Dog is Food Aggressive! Food aggression in dogs is always worrying. If your dog is aggressive around his food, it’s important to manage the problem safely until a professional can help. You need to make sure that you, anyone else in the house and other pets in the house are all safe. When a dog shows aggression due to resource-guarding, he can be unpredictable and dangerous. It is especially important when you have children living in your home. Children do not recognize the danger when approaching a dog (especially their familiar pet) and can easily be bitten by a dog protecting his food. It’s also important to recognize that your dog’s aggression might not be just for protecting his food bowl, but also any treats, bones or toys he is chewing on. One way to protect everyone from a food aggressive dog is to feed him outside where possible. If you have a fenced-in yard, you can put your dog outside to take his meals by himself. Another way is to feed him in his crate with the door shut. You can leave the empty bowl in the crate, ask your dog to go to his crate and lock the door. Then pour his kibble into the bowl safely from the outside of the crate. If you need advice on how to crate train your dog to allow this, check this guide to crate training. 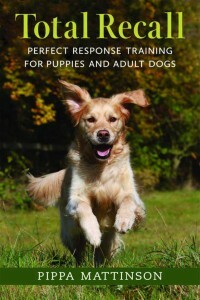 Most people don’t realize that there are different types of dog training. It’s important when dealing with canine aggression to find an experienced, trained professional. Some veterinarians take additional specialty training in vet school for behavior modification. If your vet is not specialized in behavior, he or she might have the information for the nearest canine behaviorist. Experts in dog behavior who are specifically trained in behavior modification are called behaviorists. Behaviorists who are specifically trained in this way receive special certification, so be sure to do your research to find out if someone claiming to be a dog behaviorist is actually certified. 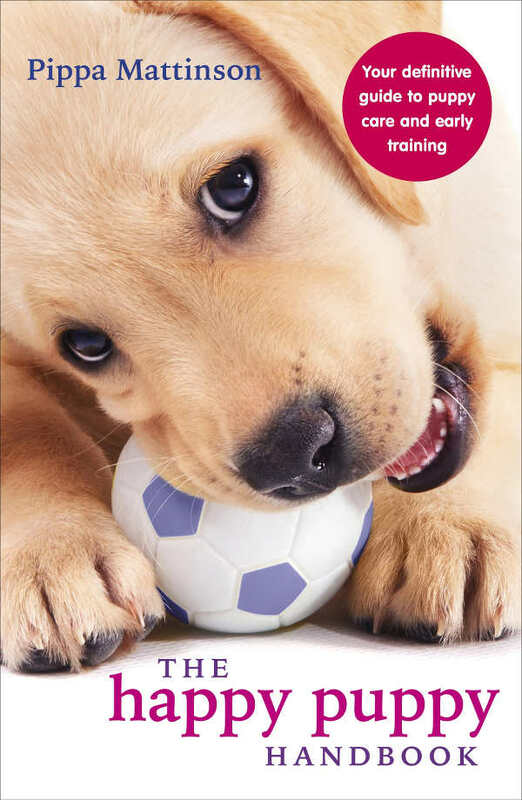 Some dog trainers specialize in aggression or resource-guarding, too. They may not be fully certified behaviorists, but if they have a lot of experience working with at least 30 or more dogs in various capacities of aggression and resource-guarding, they will be prepared to help you and your dog. If you hear your dog growling over food, you might just have the beginning stages of food aggression starting. No matter how mild or severe food aggression in dogs may be, there is never a onetime, fix-all training trick to solve it. You’ll need to work repetitively, gradually and patiently to solve your dog’s possessiveness over food. Be sure to start by talking to your veterinarian to rule out medical problems. Then seek professional help from a vet specialized in behavior, a certified behaviorist or a dog trainer who specializes in dog food aggression training techniques. Any of these professionals should know how to stop food aggression in dogs. With patience, time and professional help, food aggression in dogs can be solved. Marder, A.R., et al., 2013, “Food-Related Aggression in Shelter Dogs: A Comparison of Behavior Identified by a Behavior Evaluation in the Shelter and Owner Reports After Adoption,” Applied Animal Behavior Science, September 2013.